Tim's appear to have gone for the 'all things for everyone' approach to packaging design. They have maintained their traditional red and white stripes, they have also included their similarly traditional mountain graphic. There is also a modern graphic of a badly drawn pot of Sour Cream and Cheese. Overall, the effect seems to mix modern with classic along with mundane fonts not very well. We do however like the flavor color coding. These Chips were thick like crackers rather than Chips. They snapped evenly, with crumbs flicking far in the air. The crunch was similar. There was the robust crunch of a Kettle Chip, but also the crispy smash of a regular Chip. They say they are 'Extra Thick & Crunchy' on the packet and they are. Among the thickest Chips on the market. Often with thick Chips they turn out flat after the cooking process. Not so these. There were bends and curls, but unlike deep cooked Kettle Chips, the oil had taken revenge on the potato slices for entering its domain by boiling its skin like festering and exploding escapee bubbles. There was also an orangish glow from the seasoning. Cheddar is the Cheese of choice in the UK, where they invented the Cheese & Onion Crisp way back in the 1950s. It was the first Potato Chip with flavoring apart from salt. The Cheese ranges from mild to mature. 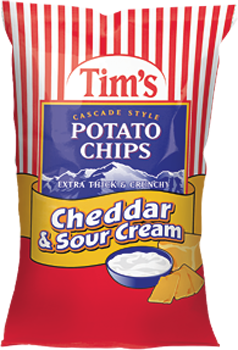 In the US it tends to lean more towards mild end, so to match it up with Sour Cream rather than a zingy combatant flavor such as Onion, would seem weird to Brits. However, these Chips had a really warm and comforting, in front of the fire with a movie and glass of wine on a dark winter's night, feel to them. They were particularly mild on flavor, but they were very enjoyable.